This quarter has been a whirlwind as we hit theater in Kuwait, and proceeded to spend nearly half of our time so far traveling to other locations (combat) where our Engineers are working. During this time, I’ve had the privilege of serving in Arifjan’s Zone 6 Contemporary Protestant Service with some really great Chaplains. But before I share how it relates to this chapel, I need to give you some backstory. About 4.5 years ago, one of my Soldiers gave his life to the Lord after a long bout with drugs and PTSD. He accepted Christ in a mental health ward at the VA, and I proceeded to disciple him over the course of the 9 months he was in a PTSD program. He came out a changed man because of the work Christ did in his heart. He joined a video chat bible study I was leading, and was growing in leaps and bounds. 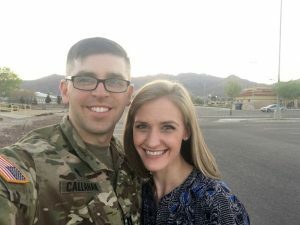 Just prior to our deployment he felt God calling him to retire from the military and pursue a nursing career. Things were going very well: he was running after God, he was engaged to be married in the summer, and he was chipping away at his classes. I was forced to suspend the group as I prepared to deploy, but we kept in touch. Through the many years of discipleship, he had become a great friend. In the beginning of June, I received a desperate message from his fiancé, saying that my friend, Neil, had stopped taking his medication and relapsed into drug use for the first time in 3 years (he had a very brief stumble before that, but had been largely clean for 4.5 years). He had gone to the VA twice but checked himself out each time and went back to the drugs. She hadn’t seen or heard from him in 2 weeks and was desperate for help. I immediately began praying and tried to reach out. Nothing. This was all the morning of the Sunday I was supposed to preach in the chapel. My sermon was on Pentecost and the power of the Holy Spirit. I went to the service, troubled, but committing it to God in prayer. I preached, and toward the end of the message I felt God lay on my heart a challenge: if you really believe in the power of my Spirit, then have the church stand up and pray. I had the entire chapel congregation stand on their feet and told them the situation. I then called on them to pray along with me, and at the end, in unison, to pray the words, “God, please bring Neil home!” I prayed while everyone silently prayed with me, and then together we all cried out three times (for holy emphasis), “God, please bring Neil home!” I closed the service, went to lunch, and then went back to my room to pray. On Tuesday morning, less than 48 hours from the time the chapel congregation prayed, he finally worked up the strength to leave and drove to the VA hospital. We had a voice call and I could hear the beginning of change in his voice. He was scared, but needed to get free. He said on Sunday he suddenly “woke up.” He was laying on a couch in a house, and suddenly realized what was happening. He realized he hadn’t eaten in days, he smelled terrible, and he looked even worse. He realized that he needed help. We spoke every day for the two weeks he was in the hospital, and now he is checked into a 21-day PTSD program with the VA. When I talk to him, he sounds like the old Neil: the Neil who loved Jesus and pursued him with all his heart, mind, soul, and strength. He has begun to pick up the pieces and get his life right. I believe that God woke him up that Sunday. I believe the Holy Spirit broke through that darkness and the chains that were holding him in place. I believe the Holy Spirit gave him the strength to face his shame and go get help. And now, I believe with all my heart, that God has brought him back like the Prodigal Son. He has continued His good work in his heart, and Neil is back on track. I told the chapel congregation what happened the following week. People said they had chills listening to it. We all gave thanks and praise to God. Neil’s fiancé was beside herself with relief and thanks to God. She had been ready to give up all hope in prayer, but then God’s people prayed, and prayed, and prayed. This experience will forever remain in my heart as a reminder of God’s gracious presence, and the power of prayer when His people lift their voices together in intercession. Distance is no hindrance to the efficacy of prayer. God heard a symphony of voices in Kuwait, New York, New Jersey, Wisconsin, and other places, and intervened in Neil’s life in a small house somewhere in Long Island. God is awesome. Pray for Neil, and his continued restoration. Pray for more opportunities to share the good news with Soldiers. Please pray for strength, as all the travel and the seriousness of some of the issues I have been dealing with in the unit are very wearying. Pray also for Sean and his wife, Cindy, during this time of separation. 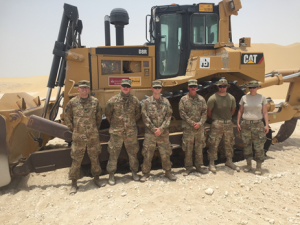 Pray for health, safety, and good communication during deployment…on both sides of the world! For more stories of God working in and through CBAmerica chaplains, check out our webpage at www.cbamerica.org/chaplaincy. For information on what it takes to be endorsed for chaplaincy in the reserve components, contact Andy Meverden, Director of Chaplaincy at chapandy@cbamerica.org.